Dozens of U.S. cities made 2018 the year of the plastic straw ban. But if we really want to reduce the plastic pollution rapidly amassing in our oceans, 2019 must be the year we challenge the fossil fuel industry’s plan to aggressively expand plastic production. Yes, those straw bans help. Straws contribute to ocean plastic pollution that’s expected to outweigh all the fish in the sea by 2050. Those who pushed the anti-straw #StopSucking campaign — and journalists who gave high-profile coverage to the plastic-pollution crisis — deserve tremendous credit for the quick adoption of plastic straw bans over the past year. Along with earlier plastic-bag bans and restrictions on Styrofoam packaging, these actions can significantly reduce the flow of plastic into our oceans. But it’s not enough. These gains could easily be wiped out by dozens of new plastic-production plants being built along the Gulf Coast and in the Rust Belt. They’re part of the fossil fuel industry’s stated goal of increasing plastic production by 40 percent over the next decade. Even though we’re already dumping about 8 million tons of plastic into our oceans each year — which chokes marine life, absorbs toxins, travels throughout the ocean food web and doesn’t break down for decades — Big Oil wants to make more plastic. These ethane “cracker” plants would use our oversupply of cheap, fracked natural gas to create plastic pellets, the basic building blocks of cheap plastic packaging and products. Most of that plastic will end up in our oceans, landscapes and landfills. Almost 80 percent of the plastic we produce ends up in our landfills and the natural environment, a figure that could rise now that China has stopped accepting our plastic recycling. Yet, ExxonMobil, Shell, Dow, Formosa Plastics and other companies are planning to spend $180 billion on increased plastic production in the coming years. For example, ExxonMobil is now trying to build the world’s largest plastics plant in Texas, in partnership with Saudi Arabia thanks to a deal cut by President Trump, using about $1 billion in subsidies from Texas taxpayers. That means this project is paying a murderous regime and highly profitable oil company to create pollution we’ll all pay for later. Another massive plastic plant is slated for the banks of the Mississippi River, transforming an agricultural and wetland habitat into a dirty petrochemical plant. People nearby in the community of St. James Parish, Louisiana — in a predominantly African American district already known as Cancer Alley because of the toxins spewed by local petrochemical plants — are fighting the plastics plant proposed by the Taiwanese company Formosa Plastics. This is a company that has been heavily fined for spilling plastic pellets into Texas waterways, polluting the air in Louisiana, and a 2004 explosion and fire at its plant in Illinois. The fire killed five workers and forced the evacuation of a nearby town. 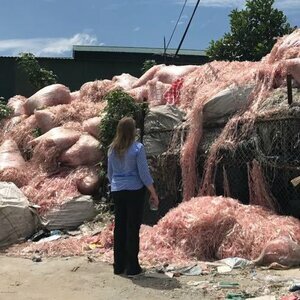 So even if it doesn’t explode or sicken its impoverished neighbors, even if its industrial runoff doesn’t contaminate the region’s vital seafood industry, even in the best-case scenario where nothing goes terribly wrong, we still end up with a bunch of cheap plastic we don’t want or need. This plastic buildout is being repeated in Ohio, Pennsylvania, West Virginia, Mississippi and the other states now processing applications for plastic plants and the pipelines that feed them with fracked natural gas. Each project spews pollution into our air and water as it produces endless amounts of plastic. Now, 2019 will be a critical year in deciding whether we slow down this plastic-pollution juggernaut or simply let the problem get worse and pass it on to the next generations. As National Geographic put it in a special issue this year, it’s time to choose between “plastic or planet.” Let’s choose the planet. Steven T. Jones is a media specialist with the Center for Biological Diversity. Jones was previously editor-in-chief of the San Francisco Bay Guardian. He worked as a journalist for 24 years, including covering coastal and environmental issues for seven different newspapers. Across the globe, we're getting serious about reducing the use of plastic bags, utensils and containers. January 2, 2019, 11:44 a.m. Plastic bags are just about everywhere, but their days seem to be increasingly numbered. As awareness of the dangers of plastic bags continues to rise — from the threat to wildlife to the fact that they aren't biodegradable — more groups are taking actions to limit their presence. The media is also taking notice. National Geographic's magazine cover shocked many readers. The company also launched a campaign called #PlanetorPlastic to raise awareness of plastic pollution and will stop wrapping its magazines in plastic. Of course, the war on plastic bags isn't new by any stretch. In 2002, Bangladesh became the first country to ban the use of thin plastic bags after it was discovered that a build up of the bags choked the country's drainage systems during flooding. In the almost 20 years since then, more countries and individual cities have taken action, including taxing the use of the bags or following Bangladesh's lead and outright banning them. And the scope of the war is expanding beyond bags. Plastic straws, bottles, utensils and food containers are all fronts in this ongoing battle, as the convenience and low monetary cost of single-use plastic items is outweighed by a desire for a sustainable lifestyle. Beginning in 2019, grocery stores and supermarkets in South Korea can no longer provide single-use plastic bags to shopper except to hold "wet" food like fish and meat. Instead, they will be required by law to provide cloth or paper bags that can be either recycled or reused. The penalty for violating this law is a fine up to 3 million won (about $2,700 U.S.). The Taiwanese government announced plans to steadily phase out the use of plastic straws, bags, utensils, cups and containers by 2030. By 2019, fast-food chains will no longer be allowed to supply plastic straws for in-store use, meaning no plastic straws for someone having a meal inside the restaurant. By 2020, free plastic straws will be banned from all eating and drinking establishments. By 2025, the public will have to pay for to-go straws, and by 2030, there'll be a blanket ban on the use of plastic straws entirely. Other plastic goods, including plastic bags, utensils and food containers will face a similar phase-out process. If a retail company files invoices for uniforms, which many do, according to the Hong Kong Free Press, then that company will no longer be allowed to offer free versions of those products after 2020. While that might seem like a loophole of sorts — "Our employees will no longer have to buy or wear uniforms we provide so we can continue to offer plastic items." — it's one that will close by 2030 when another blanket ban on those products will be introduced. The minister who oversees this program, Lai Ying-ying, emphasized that this is more than just a job for the Taiwanese Environmental Protection Agency; the entire country, he said, needs to rally behind it if it's to be successful. It's a daunting challenge as the Taiwanese EPA estimates that a single Taiwanese person uses around an average of 700 plastic bags a year. The European Union is following a similar path for its 28 member states in an effort to curb the use of plastics that "take five seconds to produce, you use it for five minutes and it takes 500 years to break down again," Frans Timmermans, the first vice president of the European Commission, the body responsible for managing the EU's day-to-operations, told the Guardian in January 2018. Plenty of countries within the EU have their own plans in place to reduce plastic consumption, but the EU aims to have all packaging on the continent be reusable or recyclable by 2030. But first, they have to decide the best course of action to achieve that end. The first step is an "impact assessment" to determine the best way to tax the use of single-use plastics. The EU also wants its member states to reduce the use of bags per person from 90 a year to 40 by 2026, to promote easy access to tap water on the streets to reduce the demand for bottled water and to improve states' ability to "monitor and reduce their maritime litter." In October 2018, the EU voted overwhelmingly to ban a wide range of single-use plastics in every member state. The European Parliament voted 571-53 to forbid the use of plastics such as plates, cutlery, straws, cotton buds and even "products made of oxo-degradable plastics, such as bags or packaging and fast-food containers made of expanded polystyrene." For other disposable items that don't have an alternative replacement, the EU ruled that member states have to reduce consumption by at least 25 percent by 2025. "This includes single-use burger boxes, sandwich boxes or food containers for fruits, vegetables, desserts or ice creams. Member states will draft national plans to encourage the use of products suitable for multiple use, as well as re-using and recycling. Other plastic items like beverage bottles will have to be recycled by 90 percent by 2025 as well. Another goal is to reduce cigarette filters that contain plastic by 50 percent by 2025 and 80 percent by 2030. The EU also wants member states to ensure that ghost nets and other fishing gear are recycled by at least 15 percent by 2025. All these regulations may seem overly ambitious in such a short time period, but Belgian European Parliament member Frédérique Ries, who is responsible for this bill, is optimistic these goals can be accomplished. "We have adopted the most ambitious legislation against single-use plastics. It is up to us now to stay the course in the upcoming negotiations with the Council, due to start as early as November. Today’s vote paves the way to a forthcoming and ambitious directive," wrote Ries. "It is essential in order to protect the marine environment and reduce the costs of environmental damage attributed to plastic pollution in Europe, estimated at 22 billion euros by 2030." The United Kingdom, which is still in the process of Brexiting from the EU, likely won't be subject to these regulations. However, as MNN's Matt Hickman reports, there's a sizable effort underway to reduce it use of plastic. In August 2018, New Zealand's Prime Minister Jacinda Ardern announced the country would phase out plastic bags within a year. "We’re phasing out single-use plastic bags so we can better look after our environment and safeguard New Zealand’s clean, green reputation," Ardern told The Guardian. "Every year in New Zealand we use hundreds of millions of single-use plastic bags. A mountain of bags, many of which end up polluting our precious coastal and marine environments and cause serious harm to all kinds of marine life, and all of this when there are viable alternatives for consumers and business." Businesses will have six months to stop distributing plastic bags or face fines up to NZ $100,000. Many supermarket chains and major retailers have already committed to stop using plastic bags by the end of the year. Ardern said many Kiwis welcome the ban and cited a petition signed by more than 65,000 citizens calling for it. However, the same reaction can't be said for its neighboring country, Australia. Most territories and states in Australia have banned single-use, lightweight plastic bags except for New South Wales and Victoria — home to the country's largest cities, Sydney and Melbourne. However, there was an uproar after Woolworth's and Coles, two large retail chains, tried to implement a ban on plastic bags. Many customers protested and after just several weeks Coles decided to sell reusable plastic bags for a small fee in lieu of the lightweight bags. "Some customers told us they needed more time to make the transition to re-usable bags," a Coles spokesperson told CNN. Local Australian news outlets reported that some customers accused Coles of a marketing ploy by charging for reusable bags. The Shop, Distributive and Allied Employees’ Association also reported in July that a Woolsworth employee was attacked by a customer who was upset over the ban. The organization surveyed 120 employees and found that 50 reported being harassed by customers. Australia isn't the only the continent to experience various reactions to plastic bags. Africa has its own mix of success. Plenty of African nations have engaged in curbing the use of plastic bags over the years. Some countries, including Gambia, Senegal and Morocco, have banned plastic bags, while others, like Botswana and South Africa, have instituted levies on plastic bags. The success of these efforts vary from country to country; in fact, there's a black market for plastic bags in a few of them. The levy on thicker plastic bags in South Africa, for instance, has been a partial failure, according to a University of Cape Town 2010 study [PDF], due to the levy simply not being high enough, so consumers incorporate the cost into their purchases. Meanwhile, Rwanda saw an uptick in black market sales and smuggling of plastic bags following a 2008 ban. Police have set up checkpoints at various border crossings to search people for the contraband. In perhaps the continent's longest-running plastic bag struggle, Kenya instituted the world's toughest ban on plastic bags in August 2017, with punishment ranging from steep fines to prison sentences. This represented the country's most severe attempt to ban the use of plastic bags over a 10-year effort. Even this, however, hasn't stopped the production of plastic bags, and night raids have been considered to disrupt the illegal manufacturing of plastic bags. Banning plastics is tricky to navigate in the U.S. This might not surprise you, but plastic bag politics in the U.S. are decidedly scattershot. Cities and their respective counties may end up with different policies in place, with cities acting ahead of their counties, which can cause confusion if you need to go shopping in one city on your way home to another city but you don't have any reusable bags with you. While a city may pass an ordinance banning plastic bags, the state could effectively overturn that ruling, which is what happened in Texas. The city of Laredo banned plastic bags several years ago, but the Laredo Merchants Association challenged that decision in 2015 saying the state's law, the Texas Solid Waste Disposal Act, protected a business' right to use plastic bags. The city argued that the statute fell under an anti-littering ordinance, and the case was taken up by the Texas Supreme Court this year. The court voted unanimously that the city law was invalid because the state's law usurps the city. The court's ruling could ultimately affect other Texas cities that have also sought to ban plastic bags. However other states, like Florida and Arizona, have banned the ban of plastic bags, while South Carolina is close to doing the same. While that eliminates confusion for sure, it doesn't actually solve the environmental problem. One company is even jumping on the bandwagon. Kroger announced in August 2018 that it would stop using plastic bags by 2025. Banning other plastic items, like straws and utensils, is gaining some steam, but only at the local level. For instance, Seattle's ban on plastic straws and utensils goes into effect on July 1 in all places that serve food and drinks (plastic bags have been banned in the city since 2011). Some establishments around the city cut out straws in September 2017, when the ban was announced, while other venues, like CenturyLink Field, SafeCo Field, made the switch to compostable straws and utensils before the city's ban. Indeed, SafeCo recycles or composts 96 percent of its waste. Restaurants in other cities, including San Diego; Huntington Beach, California; Asbury Park, New Jersey; New York City; Miami; Bradenton, Florida, have pledged to either ban straws entirely, or simply not provide them unless a customer asks for them, according to a June 2017 article in the Washington Post. As you can see, it's a patchwork approach to a global problem. Editor's note: This article has been updated since it was originally published in March 2018. 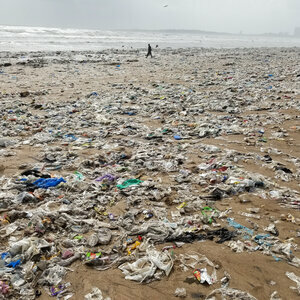 Labels: Africa, Asia, Australia, Bag Bans, Europe, Ocean Policy, Plastic Bag Wars, Plastic Bottle Ban, Plastic Pollution, Seattle, Straw Wars, What Can You Do? Ecologist Chelsea Rochman (left) and researcher Kennedy Bucci dig through washed-up debris along Lake Ontario. They're looking for small particles of plastic that make their way into oceans, rivers and lakes. Scientists call the tiny pieces "microplastics" and define them as objects smaller than 5 millimeters — about the size of one of the letters on a computer keyboard. Researchers started to pay serious attention to microplastics in the environment about 15 years ago. They're in oceans, rivers and lakes. They're also in soil. Recent research in Germany found that fertilizer made from composted household waste contains microplastics. And, even more concerning, microplastics are in drinking water. In beer. In sea salt. In fish and shellfish. How microplastics get into animals is something of a mystery, and Chelsea Rochman is trying to solve it. Rochman is an ecologist at the University of Toronto. She studies how plastic works its way into the food chain, from tiny plankton to fish larvae to fish, including fish we eat. She says understanding how plastic gets into fish matters not just to the fish, but to us. "We eat fish that eat plastic," she says. "Are there things that transfer to the tissue? Does the plastic itself transfer to the tissue? Do the chemicals associated with the plastic transfer to the tissue?" 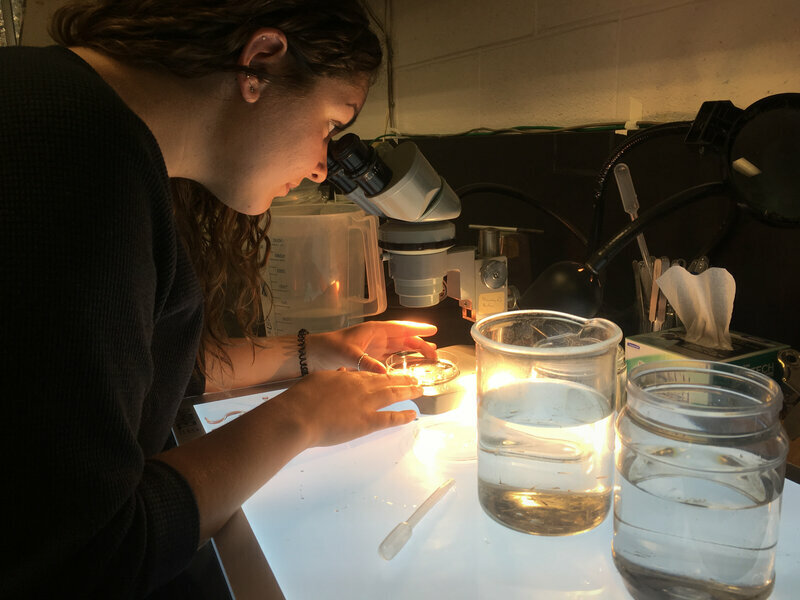 Bucci uses a microscope to look at a fathead minnow larva that has ingested plastic particles. Rochman says she has always loved cleaning up. She remembers how, as a 6-year-old, she puzzled her parents by volunteering to clean the house. In high school in Arizona she got even more ambitious. "I used to take my friends into the desert and clean up a mile of trash every Earth Day," she says. "I remember finding weird old dolls and strange old toys that I thought were creepy, but that I would also keep." As a graduate student, she landed a spot on a research vessel to visit the infamous floating garbage patch in the Pacific Ocean. She and the other scientists on the trip were supposed to count the plastic as it drifted by. She remembers the moment they sailed into the patch, "Everyone runs up to the bow and says, 'There's trash, there's trash, everyone start counting the trash.' And so we all start counting the trash." But something was wrong. "We're looking and it's, like, basically a soup of confetti, of tiny little plastic bits everywhere," she remembers. "Everyone just stops counting. [They] sat there, their backs up against the wall and said, 'OK, this is a real issue, [and it's] not an island of trash you can pick up." To Rochman, a third thing was also clear: "The tiny stuff, for me as an ecologist, this is really getting into the food chain. You could spend a career studying this stuff." A typical day for Rochman might start alongside sparkling Lake Ontario, where parks line the shore and joggers and picnickers enjoy the shoreline scenery. The lake, however, hides a mostly invisible menace. To see it, Rochman's student, Kennedy Bucci, brings us to an inlet that's ankle-deep in washed-up debris. An apartment building looms overhead. They squat down, reach into the muck and quickly find what they're looking for. "I'm digging and just finding more and more," Rochman says. "Like whole bottle caps. This is insane." "It's so ingrained in the soil," says Bucci. She comes here regularly to collect plastic for Rochman's research. They work quickly, filling a jar with bits of plastic. Rochman, who's not wearing gloves, inadvertently picks up something she wishes she hadn't. "Oh!" she laughs, flinging it aside. "That's why you've got gloves on," she tells Bucci, and then gets right back to digging. 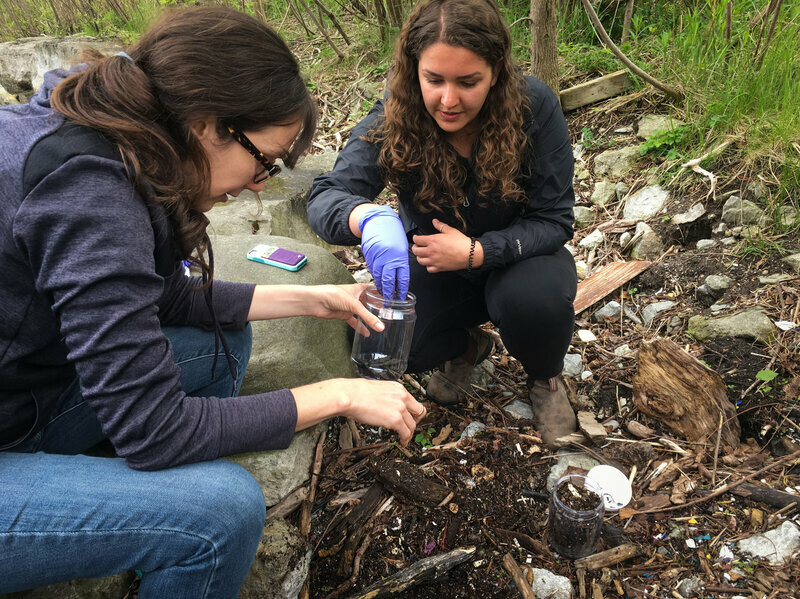 Since she started studying microplastics, Rochman has found them in the outflow from sewage treatment plants. And they've shown up in insects, worms, clams, fish and birds. 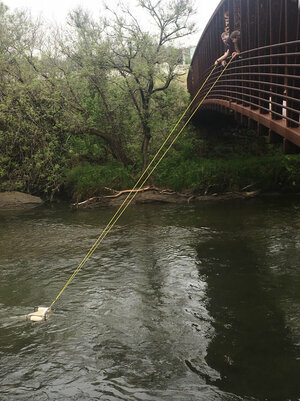 Rochman's scientific team drops a net into a stream in Toronto to collect tiny floating pieces of plastic. 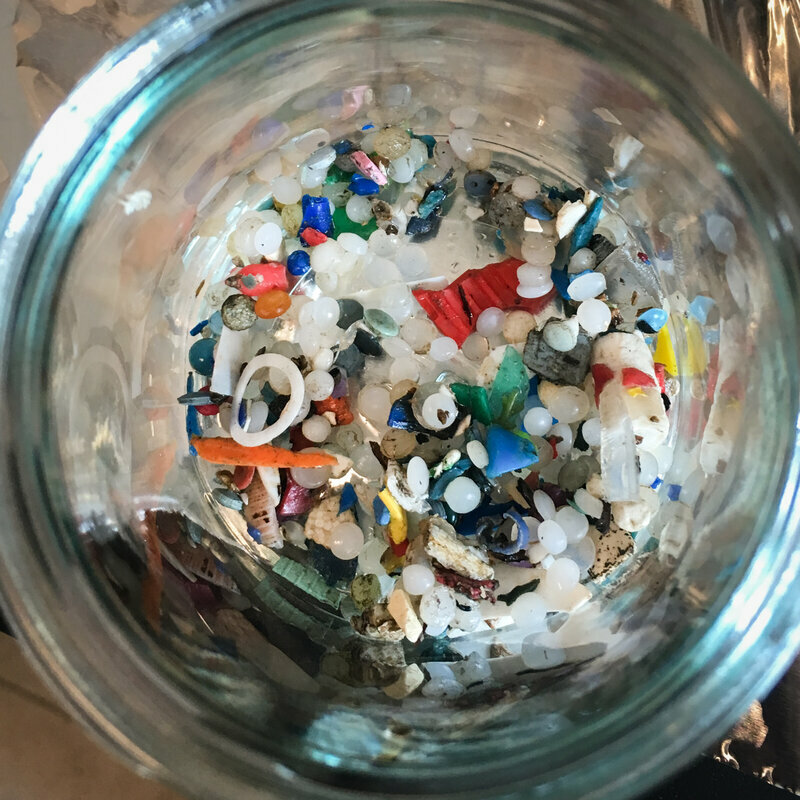 To study how that happens, Bucci makes her own microplastics from the morning's collection. She takes a postage stamp-size piece of black plastic from the jar, and grinds it into particles using a coffee grinder. "So this is the plastic that I feed to the fish," she says. The plastic particles go into beakers of water containing fish larvae from fathead minnows, the test-animals of choice in marine toxicology. Tanks full of them line the walls of the lab. Bucci uses a pipette to draw out a bunch of larvae that have already been exposed to these ground-up plastic particles. The larva's gut is translucent. We can see right into it. "You can see kind of a line of black, weirdly shaped black things," she points out. "Those are the microplastics." The larva has ingested them. Rochman says microplastic particles can sicken or even kill larvae and fish in their experiments. Plastic can also get into fish tissue, particularly plastic fibers from clothing such as fleece. Rochman found fleece fibers in fish from San Francisco Bay. She also looked in fish from Indonesia, a tropical country whose residents are not known for dressing in fleece. 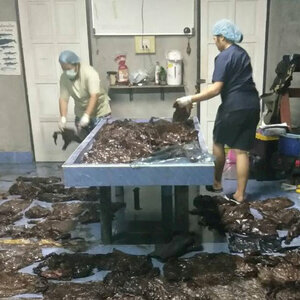 She found plastic in Indonesian fish guts, but no fibers, suggesting that fish bodies tell a story about what kind of plastic resides in local waters. Rochman took this line of research a step further when she bought a washing machine for her lab and washed fleece clothing. Lots of plastic fibers came out in the filter she added to collect the wastewater. In fact, she has found microplastics floating in the air. "If you put a piece of double-sided sticky tape on a lab bench for an hour, you come back and it's got four plastic fibers on it," she says. Most plastic is inert; it does not readily react chemically with other substances, and that's one reason it has been so successful. Plastic is resilient, durable and doesn't easily degrade. It's a vital part of medical equipment and has revolutionized packaging, especially food storage. But, over time, plastic can break down and shed the chemicals that make it useful, such as phthalates and bisphenol A. These substances are common in the environment and their effects on human health are of concern to public health scientists and advocates, but few large-scale, definitive studies have been done. 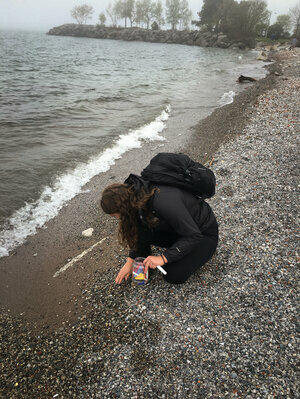 Researcher Kennedy Bucci collects plastics from the shore of Lake Ontario in Toronto. Tracking all those chemicals is researcher Clara Thaysen's job. "Right now we're starting with the common types of plastic, so polyethylene, polypropylene [and] polystyrene," she explains. "But, there's..." she pauses and sighs. "There's tons." Plastic comes in many forms, with a wide variety of chemical additives depending on how the plastic is used. What happens to plastic over decades just hasn't been studied deeply. "This happens all the time," says Thaysen. "We invent something that seems really great and ... we don't think and we become so dependent on it." Rochman notes that this kind of research is relatively new; most of the environmental studies on microplastics have come out within the past 10 years. "The things we don't know," she says, are daunting. "What are all the sources where it's coming from, so that we can think about where to turn it off? And once it gets in the ocean, where does it go? Which is super-important because then we can understand how it impacts wildlife and humans." A new study that tracked the global manufacture and distribution of plastics since they became widespread after World War II found that only 2 billion tons of that plastic is still in use. Seven billion tons is stuck on Earth as garbage in landfills, recycled trash or pollution in the environment, including deep oceans, where it’s been discovered in the mouths of whales and the bellies of dead seabirds that mistook it for food. A small amount is eliminated in incinerators. Plastic’s most lucrative market is packaging commonly seen in grocery stores. It could be in front of you right now, in the form of a water bottle, a carryout lunch container, or an iced-coffee or tea cup with its disposable straw. It’s a miracle product that’s also in your office chair, phone and computer keyboard. The pipes that move water in your building are often plastic. You probably touch plastic to switch on the car radio on the foam plastic dashboard. Plastic is pretty much everywhere humans are at any part of the day, anywhere in the world. In 1960, plastic accounted for just 1 percent of junk in municipal landfills across the world. As single-package containers led to an explosion in convenience and use, that number grew to 10 percent in 2005. A recent study in the Proceedings of the National Academy of Sciences estimated the amount of plastic debris floating in the open ocean at 7,000 to 35,000 tons. “If current trends continue, the researchers predict over 13 billion tons of plastic will be discarded in landfills or in the environment by 2050,” the American Association for the Advancement of Science said in a statement announcing the new study’s release Wednesday. It was published in the journal Science Advances. “I think for me that’s the single most surprising thing, the implication of the large growth rate,” said Roland Geyer, one of the authors. Another surprise, he said, is how far the United States lags behind China and Europe in recycling plastic material. Recycling only delays plastic’s inevitable trip to a trash bin. Incineration is the only way to assure that plastic is eliminated, and Europe and China by far lead the United States in that category as well, up to 40 percent compared with 16 percent. China is easily the world’s largest producer of plastics, with Europe and North America also looming large as major players, Geyer said. Other Asian nations round out a long list of manufacturers. But consumers are the polluters, and people on every continent participate, from the Arctic to Africa. Plastic’s vampire-like life cycle is nothing new. What’s new with this research is its use of plastic-production data with “product lifetime distributions from eight different industrial sectors” to build a scientific model that showed “how long plastics are in use before they reach the end of their useful lifetimes and are discarded,” the study said. Geyer, an associate professor at the University of California at Santa Barbara, wrote the study with two colleagues, Jenna Jambeck, an associate professor at the University of Georgia, and Kara Lavender Law, a researcher at the Sea Education Association in Woods Hole, Mass. The scale of the world’s plastic consumption and waste shocked them. “Even we were kind of surprised at the sheer magnitude of plastics being made and used,” Geyer said. He said he hopes politicians, conservationists and consumers will pay attention to what they found. Unless it’s burned, plastic has nowhere to go but in the ground or the water. “I think most experts agree these polymers . . . are going to be with us for decades if not centuries,” Geyer said. Labels: Plastic Pollution, Recycling, Refuse Renew Precycle, What Can You Do? Plastic trash is now so ubiquitous that researchers have found hundreds of tons of it floating in the Arctic Ocean. It may not sound like much, but it’s a surprising amount given the area’s sparse population. The researchers who measured the plastic debris in the waters near the north pole described it as “widespread and abundant,” according to a study last month in the journal in Science Advances. Cózar and his colleagues estimated that 63% of the ice-free Arctic Ocean is “slightly polluted” with various types of plastic debris, including fishing line, microbeads and fragments of plastic products. Of the plastic trash that makes it to the Arctic, 95% of the plastic “dead ends” in either the Greenland Sea or the Barents Sea, north of Scandinavia. Although the world’s other ocean “garbage patches” are significantly larger than the plastic accumulation in the Arctic, the average concentrations of plastic found there were comparable to those found in the Pacific, Atlantic and Indian oceans. In a 2014 study, Cózar and his team estimated those oceans contain 10,000 to 35,000 tons of plastic pollution, which almost never fully decomposes on its own. Their latest findings suggest 3% of that global total is floating in the Arctic. In 2013, researchers aboard the Tara Oceans expedition who were working with Cózar sampled 42 sites of ice-free ocean around the Arctic Circle. Using mesh nets, they skimmed for bits of plastic floating on the surface and for debris suspended in the ocean depths. In their analysis, the researchers estimated that between 100 and 1,200 tons of plastic is floating in the Arctic Ocean — a wide range to be sure, but one that could be narrowed with future study. The researchers also found fishing line and plastic microbeads, tiny granules that are added to toothpastes, facial scrubs and cosmetics. Microbeads are too small for the filters used in wastewater treatment plants, so when they’re washed down the drain they wind up in rivers, lakes and oceans, Cózar said. The research team also found very few remains of plastic bags and wrappers. These types of plastic may be quicker to sink because their larger surface areas attract organism growth, which weighs the material down. Over time, the sun causes plastic that’s floating on the ocean surface to degrade into tiny pieces called microplastics. The debris found in the Arctic was especially small, suggesting it traveled a long way to get there. Due to the small size of the debris and the region’s low population, the researchers involved in the new study suspected that much of the Arctic’s plastic pollution must be coming from distant sources. To test this, they retraced the debris’ possible path to the Arctic using data from 17,000 satellite buoys spread across the world’s oceans. The data revealed that floating plastic gets caught up in the North Atlantic in a stretch of a deep-ocean current called the thermohaline circulation. The thermohaline acts as a global conveyor belt powered by the temperature and salinity differences between the warm waters near the equator and the icy Arctic Ocean. Ocean currents carry warm surface water into the Arctic via a “gateway” between Iceland and Scotland. When ice forms in the northern seas, the water that remains becomes saltier. This denser seawater sinks and flows back south, into the ocean basins near the equator. As plastic pollution from the East Coast of the United States, northwestern Europe and the United Kingdom converges into a central ocean gyre in the Atlantic, the garbage accumulates on the surface and gets swept up in this slow-moving conveyor belt. It’s also possible, the study authors note, that busy shipping lanes between North America and Europe contribute some amount of plastic debris. In these areas, rising temperatures have reduced summer sea ice levels and created a layer of freshwater that seems to stop the advance of the plastic debris. However, it’s possible — depending on the density of the plastic items — that some of the debris could be forced toward the bottom of the ocean, Cózar said. Since the “accumulation zones” in the Greenland and Barents seas are fed by drifting debris from lower latitudes, the amount of plastic pollution in the Arctic is likely to keep growing — even if Europe and North America managed to stop depositing trash in the ocean altogether. This will be especially noticeable on the seafloor, which Cózar called “the final destination” of marine plastic. The accumulation of plastic in the ocean — especially in the Arctic — is a worrying sign, Cózar said. “The range of marine plastic size is so wide that any organism, from plankton to whales, could ingest plastic debris,” Cózar said. Many seabirds, for example, mistake decaying plastic for food. Animals that partake in a plastic-heavy diet could suffocate, or starve to death because they miss out on crucial nutrients. On Norway’s Svalbard Islands, gull-like birds called northern fulmars feed by snatching prey from the water’s surface. Most of the fulmars sampled were found to have eaten an average 15 pieces of plastic per animal — a level that far exceeds the ecological goals set for the region. In the Pacific Ocean, scientists found evidence of plastic accumulating in Antarctic fur seals that ate contaminated fish. As climate change warms the Arctic and melts sea ice into open ocean, the conveyor belt of plastic will likely continue even further north.